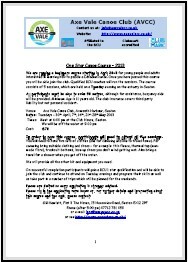 We are running ‘Go Canoeing’ Open Days for young people and adults interested in trying out canoeing. We have chosen three dates to allow for weather and will probably run the Open Day on two of the three dates listed; to be confirmed nearer the time. Come along anytime between 11:00 and 13:00 and try out our canoes and kayaks for a short 10-15 minute session on the water to see if you enjoy it (and to see the great facilities we have). We will provide all the equipment you need - just bring some suitable clothing to wear and old trainers (or water shoes). Suitable for all ages (11-60+) and especially families. <--- You can download the Information Leaflet (PDF) on the left. All participants (all sessions) must be able to swim 50 metres, although for assistance, buoyancy aids will be provided. Minimum Age is 11 years old. The club insurance covers third party liability but not personal accident. You should not get wet apart from your feet maybe. If you want to talk to someone first then please call Chris Robin on 07501 973648. Click here to read our Event/Course Data Processing Notice. BOOKINGS - East Devon Countryside website. We have for many years now offered ‘taster days’ for children attending local junior Schools. These days typically run from 9:30am to 3:00pm and use Canadian canoes with three children in each canoe with a instructor. 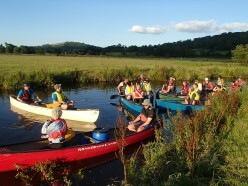 We go up river to see the Axe estuary in the morning session then do some canoe skills and play in the afternoon. Each year around 150 pupils from local schools attend these sessions; mainly from Year 6 in local Primary Schools but also from senior schools. Schools come back year after year due to the combination of learning and fun that the sessions provide. Contact: Angela Quick for more details. - Police Cadets, from two different divisions. - Ladies of a local W.I., they got very wet and came back..
- Young Farmers, a well as Old and Middle aged Farmers. - The Staff of several local businesses. - The Doctors and Nurses of a medical practice. - A Hen Party staying in Seaton for the weekend. Besides our regular and intensive commitment to our club members, schools and young persons, the Axe Vale Canoe Club reaches out into the wider community by offering very enjoyable Taster Sessions to whoever may be interested in taking part. The number of sessions we run is limited each year so please book your place as soon as possible. These are three hours sessions and take place largely on the wide estuary and lower reaches of the river Axe, where the river penetrates deep into reed beds; a very peaceful paddle well removed from noise and traffic as it is generally an area which is only accessible by canoe. “I never knew that such a lovely part of countryside existed right on our doorstep; so rich in flora and fauna; a bird spotters paradise”��. On one recent session we witnessed a deer jump into the water opposite Axmouth village and swim the full width of the estuary..